After a wildly successful debut at SDCC, GIANT-SIZE KUNG FU BIBLE STORIES, edited by Erik Larsen (SAVAGE DRAGON) and Bruce Timm (Batman Adventures: Mad Love), will be made available at comic book stores nationwide on September 3. A deluxe limited edition collection featuring the original stories of the world’s greatest cartoonists, this treasury edition comic is a must-have. 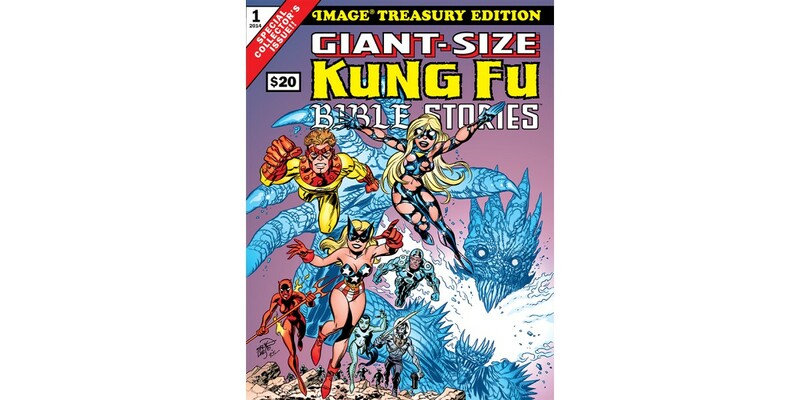 GIANT-SIZE KUNG FU BIBLE STORIES includes seven awe-inspiring, pulse-pounding stories from Erik Larsen, Bruce Timm, Adam Warren (Empowered), Tom Scioli (GØDLAND), Ryan Ottley (INVINCIBLE), and Andy Kuhn (FIREBREATHER), and four breathtaking pinups by Arthur Adams (Uncanny X-Men). GIANT-SIZE KUNG FU BIBLE STORIES will be available for $20 with Diamond Code MAY148229. The final order cutoff deadline for retailers is 8/11.